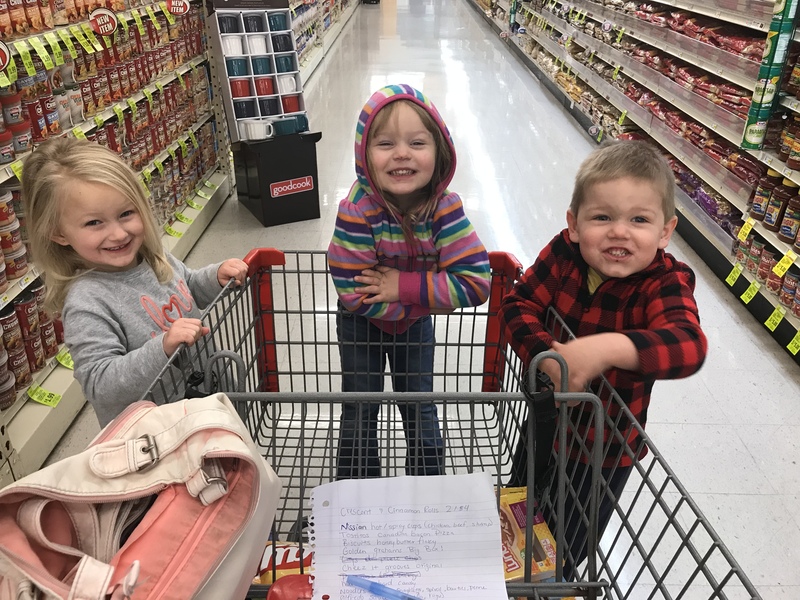 I have been in the desperate need of going to the grocery store and I don’t have a lot of time to do so anymore so I decided to take an adventure to the store with three kids. As you should know by now, I only have one child, Avarie, and I haven’t had the experience of taking multiple kids to the store. As I buckled all three children into their car seats, Avarie, Madi, and Miles, we headed off to the store. I knew this would be a daunting task as I wasn’t sure what to expect. We arrived at the store and I got them out one at a time and that’s when the wrangling of children began. I had to make sure they were all staying together and by the car as I got each one out. I had them each hold hands as we walked to the front of the store; I took a deep breath and we entered. Before we got to the store I had in my head that when I got there I was going to get one of those carts that were shaped like a race car to which I could fit all three in, but when I entered none of those carts were around so I had to come up with plan b. I had to settle for a regular cart and there was no way I could fit all three kids in one cart and still have room for groceries so that meant they had to walk. As we started through the store I had to keep calling out, stay by the cart, go this way, stop, don’t run all the way down the aisle, and at one point I had all three kids hanging onto the cart as we went around. They were pretty good for the most part, but it wouldn’t be an adventure if there wasn’t a fit being thrown. However, we did make it through the store with only one child throwing a fit so I guess you could say that is a win! When we were stopped in an aisle as I looked for what I needed, they decided to run around that aisle and Madi thought it would be okay to scoot around on the floor. I told her to get up and not to do that, and then she did it again so she got in trouble. She didn’t like being told no and getting in trouble so she started crying and wouldn’t follow when I started walking, then she sat down to throw a fit. I went and picked her up and sat her in the front seat of the cart while the other two got to continue walking. One out of three is not bad, we made it through the store and they each got to get a muffin to take home for breakfast! Very thankful I went in the early morning as there was not very many people there which made it easier to let the kids run up and down the aisle we would go into. My first experience of taking multiple children to the store by myself wasn’t terrible, thank goodness! What stories do you moms have of dealing with multiple children at the store? How do you deal with them running around, acting crazy, or throwing a fit?